No matter how hard she tries, little Queenie Quail can’t keep up with her Mama and her Papa and her nine bobbing, tapping siblings. “Hurry, hurry, hurry!” they exclaim as Queenie lags behind. But how can Queenie hurry when there are so many interesting things to look at? One day when she stops to admire a fascinating feather, a flash of orange catches Queenie’s eye. Spotting danger among the greenery, Queenie springs into action, hurry, hurry, hurrying to warn her family just in the nick of time. 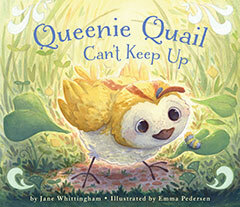 From Jane Whittingham, the celebrated author of Wild One and A Good Day for Ducks, Queenie Quail Can’t Keep Up is a story about the value of slowing down to take notice of the world around us. Whittingham’s bouncy prose is filled with lovely wordplay and musicality, pairing perfectly with debut illustrator Emma Pedersen’s whimsical illustrations in this tale that young readers will identify with and ask for again and again.